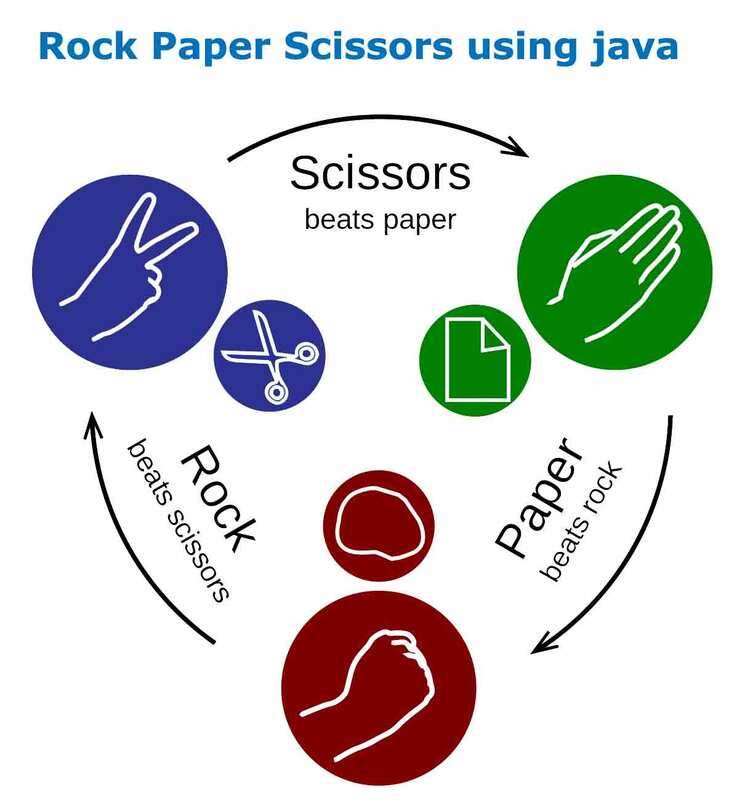 In this example we are going to develop a Rock Paper Scissors Game using Java. Developing games while learning java enhances our programming skills. Who ever wins 5 times first is the Winner. In this example the game will be between a user and the computer. Learn Core Java Properly through my Private Core Java Online Training to be able to write games in java easily. We will create a class Player.java that represents the user who is going to play the game with the computer. The class Computer.java represents the Computer that is playing with the user. Driver.java is a helper class containing the Rock Paper Scissor constant variables and the business logic code. RPS.java is the class containing the main function where the program execution will begin. We will ask the user to enter his name. Then select one among ROCK PAPER SCISSORS. Then we will let the computer randomly select ROCK PAPER SCISSORS. We will use the business logic function to find out who wins. And every time we will display the selections made and who won. The can decide to end the game any time. We will keep a track of who wind 5 times first. And then display the winner. Player.java will represent the User playing with the computer. // play again and return true or false accordingly. Computer.java will represent the computer that is playing with the user. // we have used Random class from java.util. Driver.java is a helper class containing constants and business logic. RPS.java contains the main method. This is the starting point of program execution. RPS rps = new RPS();//Initialization occured. //This function is called recursively till the player wants to play. //It is even exited if the user of computer completes the first 5 wins. Chinmay selected ROCK computer selected SCISSORS Chinmay Beats computer You won! Chinmay selected SCISSORS computer selected PAPER Chinmay Beats computer You won! Chinmay selected ROCK computer selected PAPER Computer Beats Chinmay You Lost! Chinmay selected SCISSORS computer selected SCISSORS Tie! Chinmay selected PAPER computer selected ROCK Chinmay Beats computer You won! Chinmay selected PAPER computer selected SCISSORS Computer Beats Chinmay You Lost!